From analyses of morphological data, the closest extant relatives of the Passeriformes were considered to be either the Piciformes or taxa of the non-monophyletic "Coraciiformes" (Manegold 2005; Livezey and Zusi 2007). Recent analyses of nuclear gene sequences, by contrast, resulted in a clade including the Passeriformes and Psittaciformes (Ericson et al. 2006; Hackett et al. 2008). This hypothesis is as yet not supported by independent gene loci. It is, however, of particular interest because of the fact that the Passeriformes can be shown to be the sister group of the Zygodactylidae, which were among the most abundant small birds in the Paleogene of the Northern Hemisphere. Both the Psittaciformes and the Zygodactylidae have zygodactyl feet, and if future studies support a close relationship to parrots, passerines may thus have evolved from an at least semi-zygodactyl ancestor. 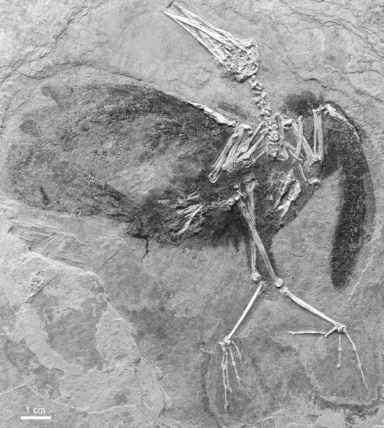 1999) that Zygodactylus is closely related to early Eocene birds, which were classified into the taxon "Primoscenidae." Accordingly, the latter taxon, which was established by Harrison and Walker (1977), was synonymized with the Zygodactylidae (Mayr 2008h). These early Eocene zygodactylids (i.e., the "primoscenids") are known from many complete skeletons and isolated, three-dimensionally preserved bones (Figs. 16.10, 16.11). The first species was described by Harrison and Walker (1977) as Primoscens minutus, on the basis of an incomplete carpometacarpus from the London Clay (Fig. 16.10). Additional and much more complete London Clay specimens were collected by Michael Daniels from Walton-on-the-Naze (Fig. 16.11; Daniels 1994; Mayr 1998b; Daniels in Feduccia 1999, Table 4.1). Articulated skeletons were further identified in the early Eocene of Messel, the Green River Formation, and the Danish Fur Formation (Mayr 1998b; Kristoffersen 2002a; Weidig 2003). 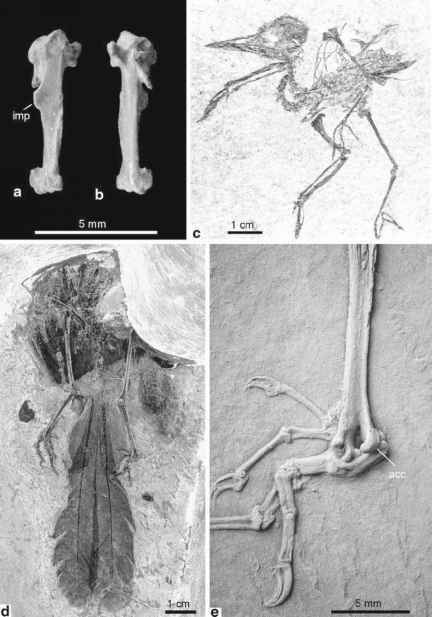 In Messel, zygodactylids are among the most abundant small birds, and the three currently recognized species, Primozygodactylus danielsi Mayr, 1998, P ballmanni Mayr, 1998, and P. major Mayr, 1998, mainly differ in size and limb proportions. Zygodactylids are small birds with a long and slender tarsometatarsus and long toes. As indicated by the taxon name, they had a permanently retroverted fourth toe. The tarsometatarsal trochlea for this toe exhibits a large accessory trochlea, which in Zygodactylus is distally elongated as in extant Psittaciformes and the piciform Pici. Otherwise, however, the distal tarsometatarsus of these two extant taxa markedly differs from that of Zygodactylus. 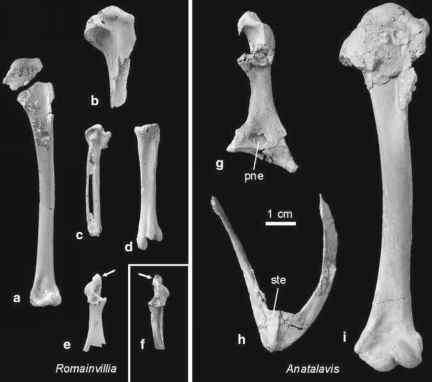 The carpometacarpus is short and exhibits a very large intermetacarpal process, similar to that of extant Passeriformes and Piciformes. The beak of Primozygodactylus is thrush-like and neither very long nor very short. In some Messel specimens of Primozygodactylus long tail feathers are preserved, and it can be discerned that the two central rectrices are greatly elongated (Fig. 16.10; Mayr and Zelenkov 2009). Ballmann (1969a, b) considered the phylogenetic affinities of Zygodactylus uncertain. The taxon was classified into the Zygodactylidae, within the piciform Galbulae (puffbirds and jacamars), by Brodkorb (1971), and Simpson and Cracraft (1981, p. 492) also tentatively placed Zygodactylus within the Pici. Piciform affinities of Zygodactylus were questioned by Olson (1983, 1985), who raised the possibility that its zygodactyl foot evolved independently from that of any of the extant taxa. large and in that there is a marked tubercle in the center of the cranial surface, above the dorsal condyle (Fig. 16.11; see Fig. 25A in Mayr 1998b). 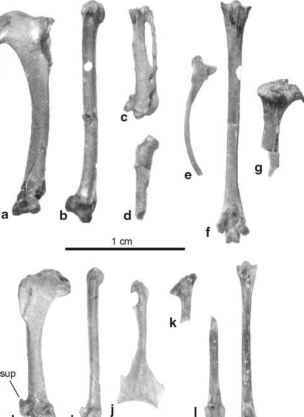 Before recognition of the skeleton of Z. luberonensis, zygodact ylids ("primo-scenids") were assumed to be most closely related to either the Piciformes (Mayr 1998b) or the Passeriformes (Mayr 2004g). I now consider the derived similarities in the shape of the accessory tarsometatarsal trochlea of Zygodactylus and the Pici to be a striking example of convergence. Zygodactylids lack derived characteristics of crown group Piciformes, most notably a proximally directed process on the proximal phalanx of the major wing digit (Mayr 2004g, 2008h). As in passeriform birds, but unlike in the Piciformes, the hypotarsus exhibits a closed canal for the flexor hallucis longus muscle, and the tarsometatarsus is greatly elongated and bears a lateral plantar crest. A sister group relationship between the Zygodactylidae and Passeriformes was also supported by a phylogenetic analysis in which the new osteological data obtained from Z. luberonensis were included (Mayr 2008h). The holotype of Primozygodactylus major is preserved with stomach content consisting of grape seeds (Vitaceae) (Mayr 1998b), and seeds are also found in the area of the intestinal tract of several other Messel zygodactylids. The proportionally longer toes and larger accessory trochlea for the fourth toe indicate that Zygodactylus had a way of living different from that of early Eocene zygodactylids. The greater span width of the toes may indicate a more terrestrial way of living, possibly in a more open habitat (Mayr and Zelenkov 2009). The significance of the larger accessory trochlea is uncertain. I hypothesized (Mayr 2008h) that this feature may represent an adaptation for clinging to tree trunks, possibly for excavation of nesting cavities, but noted that downright trunk climbing can be excluded because of the morphology of the tarsometatarsal trochlea for the third toe.